Cupcakes with vanilla frosting can be seen on bake-sale tables, in classrooms and in upscale bakeries. While no one expects a cupcake to be healthy, some may be worse than others in terms of total fat, saturated fat and calories. Some cupcakes may have a small quantity of fruit, vegetables or antioxidant-rich chocolate, but in general, cupcakes should be consumed in extreme moderation. If you're baking at home, you probably rely upon a standard-sized muffin pan. Each muffin cup on a standard pan holds approximately 1/3 of a cup of raw cake batter. Many bakeries have replaced the standard muffin pan with a larger one that holds a half-cup of batter per cupcake. Some even use a jumbo pan that holds 3/4 of a cup of batter. If you opt for a jumbo cupcake in place of a regular one, you'll consume more than twice the calories and fat. The fat and calorie content in your cupcake will depend on the recipe you use. If you use a cake mix to make 18 standard-sized cupcakes, each cupcake (without frosting) will have less than 200 calories and 10 grams of fat, with approximately 37 mg of cholesterol. If you make nine jumbo cupcakes with the same prepared cake mix, each will have more than 400 calories and 20 grams of fat. Richer cake recipes may have more calories, a higher fat content and significantly more cholesterol. Most frostings are a mixture of sugar, flavorings and butter or shortening. Not surprisingly, frostings are quite high in calories, fat and saturated fat. 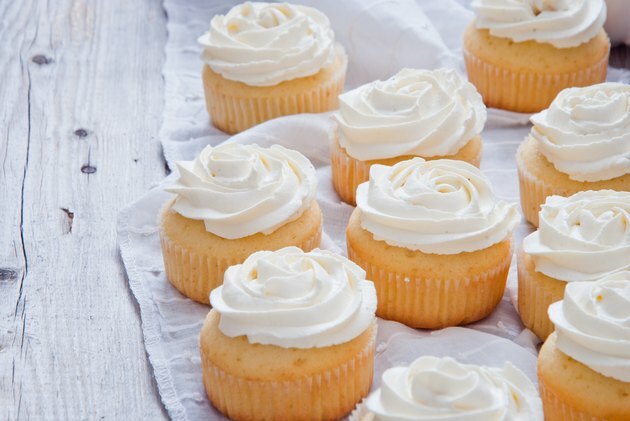 Two tablespoons of vanilla buttercream frosting have 124 calories and 4 grams of fat; this serving will adequately frost a standard-sized cupcake. You'll need to double that amount if you're frosting jumbo cupcakes. In total, a standard-size cupcake with frosting will have around 350 calories and 14 grams of total fat, with 4 grams of saturated fat. The Cleveland Clinic recommends consuming no more than 50 to 70 grams of fat daily, so if you account for the calories and limit your sugar, you can splurge on a standard cupcake. Bakery cupcakes may have more calories and fat; a standard-sized bakery cupcake without a huge swirl of icing will come closer to 400 calories and 19 grams of fat. If you opt for a jumbo cupcake, you'll pack in nearly 800 calories and 36 grams of fat. Some bakeries may pile on even more frosting, adding calories and fat with every tablespoon. How Many Calories Are in Fruitcake? Can You Bake Biscuits in a Toaster Oven?